5 x Ghost Magazine Pouches & Double Alpha Academy (DAA) Belt Deal! -- Please Choose an Option --	32" 34" 36" 38" 40" 42" 44" 46" 48" 50"
Just what every production shooter needs. The DAA belt is the best on the market and the Ghost pouches are by far the best deal out there. We recommend measuring the spacing of the gun to the belt to ensure it falls within the rules of the sport and division. Round to the next size up. Consult the table below to select the right size for you. 32" - Actual size 100cm 39.4"
34" - Actual size 105cm 41.3"
36" - Actual size 116cm 45.7"
38" - Actual size 121cm 47.6"
40" - Actual size 126cm 49.6"
42" - Actual size 131cm 51.6"
44" - Actual size 136cm 53.5"
46" - Actual size 141cm 55.5"
48" - Actual size 146cm 57.5"
50" - Actual size 151cm 59.5"
If you measure around your waist 33.85", you should choose the 34" since the overall length is 41.3"
If you measure around your waist 35.5, you should choose the 36" since the overall length is 45.7"
All the DAA belts have a built in overlap, consult the chart above for any questions. Buyers may exchange the belt for a different sizes but the buyer is responsible for shipping both ways. Ghost and AA are the best! Great setup and best deal for beginners or experienced shooters. All experience with the fallowing products are based on shooting production division. Ghost mag pouches are by far the best pouches in the galaxy. The Ghost mag pouch can be set up for your personal reloading style. The belt that came in the package was the premium belt. It's a little more fancy than the original DAA belt. The iner-belt is a bit stiffer than the original. Belt has a clear name tag holder so when you lose it the person that finds it can make fun of you by name. Great combo package and the shipping was fast. Only issue is ghost pouches have basically no instructions. But neither do Apple products. Followed the size recommendations and the belt fit perfect. The double alpha belt and ghost mag pouches are a good setup. I had questions on size and the Ben Stoeger staff provided prompt replies. 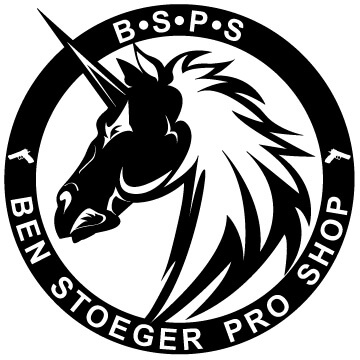 Buying from Ben Stoeger was a very positive experience.